With Aries, it’s not easy for parents since the diapers. It can not be said that he is whimsical and requires constant attention to himself — on the contrary, he does not cry for long, and then he smiles widely at everyone around him. The difficulty in the character of a small Aries lies in the fact that he always and everywhere wants independence, freedom and independence. This baby himself sets the regime for all adults, eats and sleeps only when he wants it. As soon as Aries begins to crawl and walk, he will never sit in a wheelchair or on the hands of an adult, preferring to explore the world around on his own. Aries seldom cries, even when falling or hurting, because there are so many interesting things that he simply does not have time for childish whims and complaints. Exploring the world, little Aries seeks to break down, destroy something to know what it is made of and how it is done. Toys are interested for little Aries only from the point of view of research, if the toy can not be disassembled or broken — Aries immediately loses interest to it. When the Aries-kid will be older, the best gifts for him will be puzzles, designers, Lego, as well as various logic toys, subjects for active sports and sets for creativity. Little Aries is very sociable and feels good in the company of people, but the representative of this zodiacal constellation quickly gets tired of talking and noise, and therefore parents should provide for him a quiet corner for games and contemplation, the code will bore him with communication. A few minutes of rest — and Aries-baby rushing to jump, cheerfully screaming and ruining everything in its path. Parents should never under any circumstances break down the character of Aries, impose on him any activity or point of view — he can fight against his parents, and then he will do everything to spite them. With Aries working soft tactics, but — not "lisping", and a friendly conversation on an equal footing. Parents should listen to the opinion of a small Aries, and soon they will understand that in many issues he is right. Interest in life Aries will manifest in everything, and it is useless to scold him for painted walls or spoiled toys — his thoughts never have the intention — to make things worse, even on the contrary — he tries to create, create, this creativity is still enough for parents to clutch at the heart. Aries actively learns the world, and if he is interested in beautiful atlases and books, he will learn letters at a very early age and begin to read in vain. In three years, Aries will become the why, so parents need to thoroughly prepare for the cascades of these "why". He is very hardy, likes to overcome obstacles on his way and stubbornly suffers physical pain, if he falls down — he rarely cries because his achievements and victories are important to him. When Aries climbs high — he will not be afraid of heights, but will be proud to call adults to surprise them. Little Aries is always self-confident, it is very important for him to be the first, the leader everywhere, even in company with adults. But an energetic and strong Aries has a tender and kind heart. He is not able to inflict harm on anyone, and will weep bitterly at the sight of the defenseless homeless kitten on the street, asking him to take him into the house. Learn Aries will be easy, he has a predominant visual memory. He will never cram the training material, memorizing everything from the summer, in the classroom. Aries will always use creativity to fulfill tasks. The expression "boys must have one’s fling" is invented for this sign. Having escaped from the mother’s womb, the Aries-boys are in continuous motion and manage to involve their parents in this movement. They prefer violent, active games. Aries-boys often commit impulsive actions without thinking about the consequences, and earn a few extra cones and bruises. But they quickly forget about the pain — Aries can not stand wasting time! Aries-boys are always ready to accept the challenge. They like to test their courage, they attach great importance to it. This sign rarely lacks courage, but the failure causes him disappointment. Aries-boys must understand that they are not infallible and that the rejection of reckless acts does not mean weakness. They must understand when to act, and when it is better to abstain. This sign is a born leader, in childhood Aries-boys are often the leaders in games. They are full of energy and enthusiasm, ready to experience life in full. They may seem excessively demanding and restless. However, the motivation and energy of Aries is an excellent raw material, which in later life is transformed into efficiency and will to victory. The qualities inherent in Aries are traditionally considered to be masculine — perseverance, boldness, a spirit of rivalry, so that the Aries girl is not an incarnate obedience. The strength of her character needs to manifest and recognize the world so that she can remain truly herself, otherwise the girl will have to constantly wear a mask to please and comply with the rules. Recognition begins at home: it is important that parents pay attention to the liveliness of their daughter and appreciate her. The aridity of Aries is manifested in the girls constantly together with an incredibly powerful life force, enthusiasm and the desire to prove something all the time. Aries-girls simply can not be silent obedient creatures, their liveliness always breaks out, they want parents to enjoy the fullness of life just like they do. Aries-girls can seem older than their years, because they are in a hurry to grow up. They overcome the infantile dependent stages of childhood as quickly as they can in order to gain independence. But the desire for independence does not mean maturity. Aries often want to run before they learn to walk. It should be remembered that Aries-girls need the same support as more timid signs. If in young Aries you can not suppress the beginnings of egoism, insensitivity, rudeness and cruelty, then it will be very difficult to fight these qualities later. Aries is self-willed, he does not want to obey, but you can find a common language with him, because he is, in fact, a non-malicious and responsive creature. Aries-boys should be tactfully taken away from love for games with elements of violence, rudeness, not to cultivate in them love of arms. On the outbreak of aggression, in no case can the same be answered, but such manifestations must necessarily be suppressed. 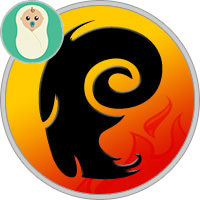 Enmity with an Aries son or daughter can result in their early departure from home. Acting is necessary by persuasion, gently, but persistently. Do not refuse them in affection: children born under the sign of Aries, despite all their independence and ruffle, are afraid that parents will stop loving them. The decisions made with regard to their decisions must be, first of all, just: Aries feels this subtly and painfully acute. Parental authority in the eyes of Aries children must be unquestionable, for mother or father there must always be the last word. Separately, we should mention the role of the father. It should be borne in mind that in the eyes of Aries his dad is also a rival, and it is important that the father and son compete in their best manifestations, and not in cruelty and rudeness. Parents should lead Aries, otherwise they can quickly go along the curved path, choosing in the role of a guide of other, stronger, but very dubious personalities.